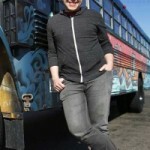 Andy Didorosi, a 26-year old Detroit native, is the president and founder of The Detroit Bus Company. A Crain’s 20 in their 20’s winner, he also ownsPaper Street, the arts and business campus; The Thunderdrome!, a local racing series; Wireless Ferndale, a free community wifi project; and BuildingMinder, a property maintenance, management and asset liquidation company. Follow him on Facebook and Twitter, if you like. On the show, Andy spoke about starting businesses in Detroit, a city where few think of starting up a successful business. One of his recent and successful ventures is the Detroit Bus Company – a company he founded by buying some buses and using them at first to meet bus routes that Andy noted were underserved or abandoned entirely by the municipal bus lines. Now, they’ve expanded to provided very popular tours and charters around the city, to such themes as prohibition and the Purple Gang from the early 20th century. Fundamentally, he spoke about how his success in innovation is about meeting a real and unique need for the community, and he thinks that similar problems will be manifesting in Rust Belt cities in the near future, which represent opportunities for motivated entrepreneurs.